The open plan Kitchen, dining and Living room on the main floor has huge unique windows on three sides opening the space up to the beautiful views surrounding it. With a well equipped kitchen with adequate cutlery and utensils and highland stoneware crockery and all the essentials including fitted ceramic hob, oven, microwave, coffee maker, toaster, kettle and more. In the Lounge there is a real wood burning Charnwood stove, flat screen TV, DAB radio and a good selection of games and DVD’s. 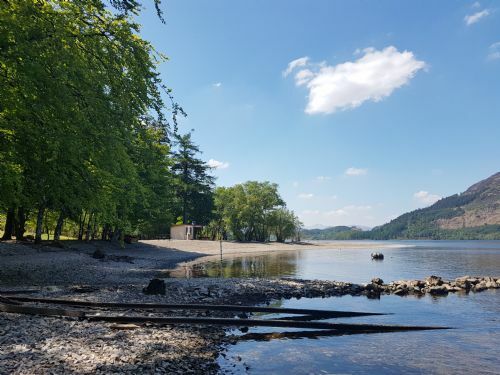 The lounge leads onto a large enclosed decking area overlooking the gardens and Loch Lochy a perfect place for a glass of wine in view of the sunset and also a safe play area for children and pets. Pets are also welcome at Riverside at no extra charge. Stunning location - hidden gem! This was our 2nd time booking, although a few years apart. Daniel was as friendly & helpful as ever. Everything is geared towards ensuring guests have a wonderful experience - even the 4 legged guests! From the well managed gardens, to the wood carvings surrounding the properties not forgetting the BBQ hut & the wee summer house at the waters edge - magical! My only very small criticism - it’s time to replace the sofa in the lodge we had, wee bit uncomfortable (sorry!) but it’s certainly not something that would stop us from booking again. 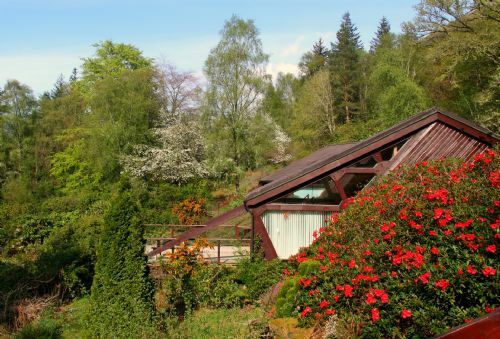 Invergloy Riverside Lodges are a blissful, tranquil haven in an idyllic part of the Highlands. The King family are exceptional owners ensuring that each of their lodges is maintained to an extremely high standard. They extend a warm, cordial welcom on arrival, & nothing is too much trouble. With our three Golden Retrievers, we have had frequent holidays at Invergloy & have never been disappointed. Invergloy, The King family & the landscape make a perfect Highland retreat. Looking forward to our next visit. The lodge was beautiful, very comfortable, a home from home, the hosts were welcoming and as helpful as you could want. The grounds are absolutely stunning, it was so peaceful and quiet, a truly wonderful holiday. Once again a fantastic week away. We really enjoyed our stay at Invergloy Riverside lodges. It was a great place for our family of 6. The location is amazing - beautiful loch side, forested, lots of mushrooms for foraging, and convenient for our day trip to Loch Ness. Our lodge was very clean and well decorated, and made cooking dinner both nights very easy. Deneil, the owner, was super helpful and friendly. We would definitely stay here again! We got 3 nights as someone cancelled and enjoyed every minute. Dogs loved the loch and we loved the gardens, even in the rain. Scenery is just stunning. Blair Lodge is comfy and homely. We are just a couple but wondered if 6 would struggle with living space and no dishwasher. Would prefer to pay extra and not bother with the electricity accounts! Also having a leg injury I would have loved a bath but these were small points. Will definitely return if we can get in! Beautiful place, that says it all. Everyone at Riverside Lodges goes the extra mile to make your stay something you will remember for a very long time. Can't thank them enough. We had great holidays in a great location. Everything was beautiful, the house, the shore of the Loch, a perfect point to do a lot of trips. A delightful location & good customer service but unwelcome extra costs and tired exterior detract. 1. The facility is listed 4* but the exterior of Blair Lodge in particular does not reflect that, very tired timber in need of a very thorough clean and re treatment. No outside light on the veranda. Facility is well resourced with everything needed in the kitchen, however, the stove needs a full companion set not just a brush and pan. The internal layout is also not ideal with no real central communal space but it is nice and clean. Not sure 6 people could stay in a facility with a single very small shower cubicle and single toilet, certainly not 6 adults and even 4 plus 2 kids would be a push in my view. 2. In over 30 years of staying in self catering accommodation of all kinds in Scotland, this was the first time I have ever paid for electricity in addition to the already very high cost of the stay itself which was 300 pounds for two nights. Both the process and the principle of having a meter read on arrival and departure then paying a nominal sum for electricity was demeaning and wholly unacceptable to me. I appreciate it is in the terms at booking and is designed to make users more aware of their consumption, however, I just feel it absolutely cannot be justified in additional to the premium paid for the hire itself. 3. Although a small amount of wood is supplied gratis, I found the charge for any additional wood unacceptable, again not expected in a 4* facility and certainly not when surrounded by 20 plus acres of woodland and countless piles of timber waiting to be processed into firewood. Given that guests inherently watch the electricity consumption and therefore the heating coupled with the fact the property is actually quite cold in the mornings unless the stove is on almost adds insult to injury. 4. Even the internet is additional cost through a dongle system, so in reality all consumables are additional, the rate you pay is literally just the property, which for the price paid I just could not justify ever again in the future and for that reason I would not return, which is a shame as the location is great and the owners are good. I appreciate this feedback will likely not be well received but feedback has to be honest. Thank you for your review, I was so saddened to read that you thought your review would not be well received, we appreciate all feedback positive or negative and pride ourselves on making sure all our guests have the best experience possible. Thank you for your kind comments about the customer service that was very much appreciated. Unfortunately your stay way not what you had expected and for that I am truly sorry. You had only stayed for a 2 night break which we actually normally do not offer. Our minimum stay is 3 nights and you had asked us to make an exception so the price of your booking probably reflects that. Timing was a real factor in your impression of the exterior of the lodges, with the Highland weather the lodges do need pressure washed and scrubbed seasonally and this was due to be done in the lodge you were staying in the following week or at the earliest opportunity we had, so we were aware the exterior was due for a good clean we were just waiting for the next day where the lodge was vacant and for the weather to be reasonable. We do offer complimentary Wi-Fi in reception which can be accessed any time, you had however chosen to hire a portable Wi-Fi device so that extra was very much an optional convenience which you chose to pay for. We will continue to charge the electricity consumption and extra firewood separately as we feel this is the most fair way to do it. The types of guests we welcome to Riverside are so varied from couples to families and walkers who are out in the outdoor all day every day to folks just looking to chill out in their lodge in front of the wood burner. So the amount these various groups consume can vary extremely, Your sundries may have seemed trivial whilst only staying 2 nights but our average stay is 7 nights and sundries bills for that length of stay vary from only £1 or £2 per day in the summer on a warm spell to £8 to £10 per day in the colder winter months so it would seem unfair to add this onto the accommodation rate based on an average. We are in a woodland location and source our firewood from our own woodlands but this is a very labour intensive process with its own costs involved from the man hours and equipment to the storage of the firewood to allow it to dry in the continuously wet conditions in the Highlands. I do sincerely appreciate your review and will take all your feedback on board, and I certainly encourage you be honest in future reviews as any good business appreciates honest feedback. Had a lovely peaceful 2 weeks hols. Great surrounding, lots of walk around. If you need anything Deneil is always around to help. A very pleasant place to spend a holiday. Plenty of peace, quiet and privacy - everything we were looking for. Surrounded by plants, trees and birds with the loch at the bottom of the garden. We even went swimming there on a couple of evenings. Beautiful location. And great for access to a range of wonderful places, from Glen Coe to Inverness and beyond. Very very comfortable. I loved everything about my stay! From the fact they not only allow dogs, but encourage them, the peacefulness, the private beach on the side of a stunning Loch, the gardens and gorge and the lodge it self. Then the fact it's really close to so many amazing walks and sights is a winner for me! The owners are also super welcoming and nothing is to much for them. Highly, highly recommended and would definitely go back some time. Great holiday in beautiful setting. 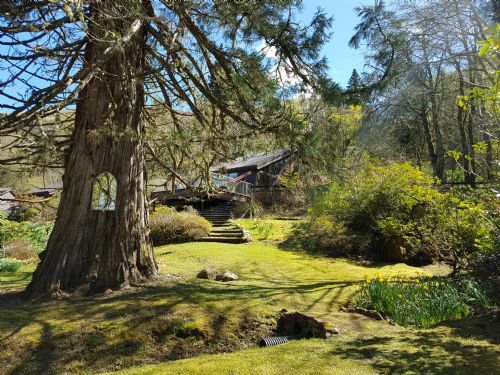 The lodge is set in stunning gardens and a magical location. Accommodation was excellent and the large patio was well used as we enjoyed spectacular weather throughout our stay. Nice welcome pack with wine and local bread. Short walk down to the lochside with a small beach cabin and barbecue available. Great scenery all around the location with Skye, Plockton, Glenfinnan and the beaches at Morar and Arisaig all do-able as day drives. Will definitely be back. We thoroughly enjoyed our stay at Blair Lodge. A great place in a superb location. 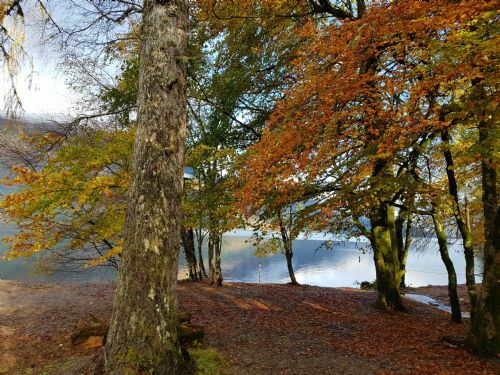 The grounds of the lodges reach down to the shore of Loch Lochy - a lovely location to relax as the sun sets over the mountain and reflects in the loch. 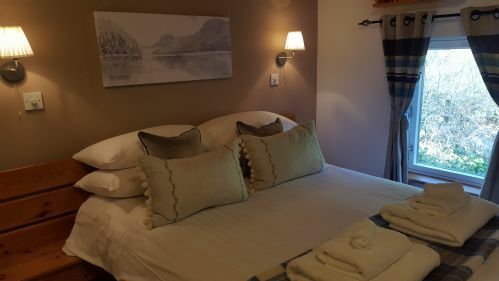 The lodge is located within easy reach of Ben Nevis and many other spectacular locations. We particularly enjoyed seeing the 'Jacobite' steam train pass over the Glenfinnan viaduct whilst we were walking in the hills nearby. The owners of the lodges were most helpful and welcoming. We hope to stay there again soon! All was good, the site, the lodge, the people, but we put "good" and "ok" for the heating and the extra charges. You should simply make the price GBP 10-15 more each night and give access to electricity, wifi, wood and heating without asking more to clients. Also put more toilet paper for 2 nights... (1 thin toilet paper is not enough for 5 persons during 2 nights). We will make good publicity for you !! (even if you don't need one we think...). A place that all the family look forward to returning to. Complete relaxation in an idyllic location. Just wonderful! We stayed five days for our wedding. 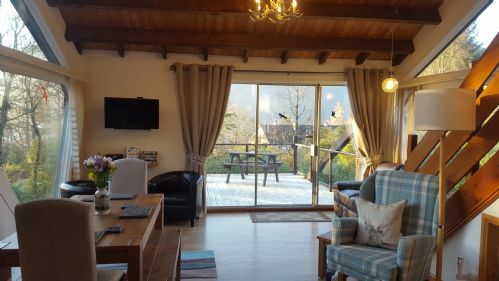 The location is perfect, with beautiful views over the hills and easy private access to the loch. This is such a tranquil and peaceful place, although close to the road you can't hear anything. The wee hut close to the loch is lovely, there is also a kid play area. It is also a fantastic place to walk dogs. We stayed in Blair Lodge, but all three lodges are almost the same. This is the best accommodation we have stayed in. This is such a comfy place especially with the wood burning stove on. We had a very warm welcome from Deneil, who surprised us with a lovely bottle of bubbly on arrival. You can book the place without thinking twice. We will definitely come back. Lovely lodge, would highly recommend. We stayed at a lodge for the October week & thought it was great. If you like outdoors then you'll be easily entertained - we went up Ben Nevis (mild autumn at the bottom & 2 inches of snow at the top), mountain biking at the Nevis trails, the kids went to the Ice Factor (12 & 16 years old) and so on. The lodge itself was lovely - comfy, a decent selection of dvds, wood burning stove & a corkscrew. What else could you want? we have started booking two of these lodges now because so many of our family and friends want to come, you are always made very welcome and the lodges are spotless,after a day outdoors it is great to come back to the lodges light the wood burner and relax,can assure anyone like myself and my family your next visit wont come quick enough. We had a great holidays in our comfortable lodge in a natural, lovely and quiet place, in front of the loch. We liked observing the birds and the views on the loch. We had a warm welcome from Deneil and her family. Thank you again! What an awesome location and what a beautiful lodge. The view from the deck is unrivalled and the short walk to the beach of Loch Lochy enticingly revealed the beauty of the loch bit by bit. We will definitely be back. Thank you Deneil for your heartfelt welcome and attentiveness. Lovely lodge in the middle of a beatiful graden close by a lake and a gorge. A perfect place to relax and recharge batteries. Actually we planned to use the place as kind of base camp for hikes in the near region but decided to have some quiet days over there since it was that lovely. Remarkable is also the perfectly equipped kitchen. Overall: We were totally satified (and would have stayed longer if it were possible) and can warmly recommend it to others. Beautiful location, very peaceful with outstanding scenery. Very good customer service, made to feel special. This was our second visit for a weeks holiday to Invergloy and, as before, we were absolutely delighted and happy to be back in this amazing location and were given a very warm welcome by Deneil and family. Throughout our visit nothing was too much trouble and every effort was made to make our stay as enjoyable as possible. 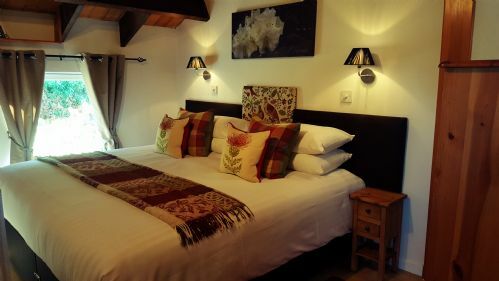 The lodge is very spacious and bright with tasteful and thoughtful furnishings. The welcome tray, on arrival, is a really nice touch. 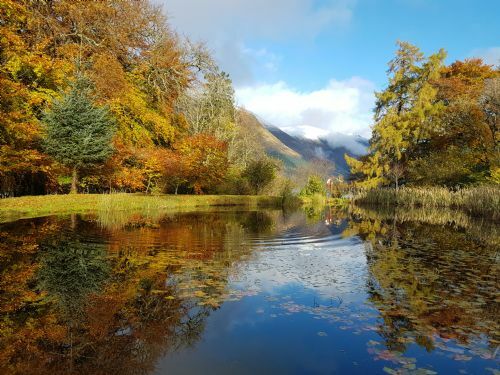 The location is an ideal base for exploring the highlands but is also peaceful and tranquil in itself and an ideal place to escape from a busy existence. The only downside was that it was a little cold and storage heaters are not very efficient in such a large space but we were told that all the lodges would be upgraded to wood burning stoves by the end of this year and this would not doubt resolve that issue. We would highly recommend Invergloy and hope to return soon. Simply beautiful in every way possible. Tranquil surroundings. Very Relaxing. Just perfect. A Wonderful place that both my wife and I will return time and time again to enjoy the most tranquil surroundings Invergloy has to offer. Wonderfully presented, well managed, no interuptions, but most of all, the luxury of allowing our dog Pete, the friendly beagle, run free for 4 days. Our autumn visit was blessed by the wonderful colours this season has to offer. A great job well done. We will be back very soon indeed. Great cabins and friendly staff in a brilliant setting. Really enjoyed our stay, Cabins are fully equipped and very comfortable and just a short stroll from the lochside. The views from the lodge and loch were amazing. Staff are very friendly and were always about to help. Already looking to go back next year. They have thought of everything even dog bags, bone, wine and flowers on arrival. Nothing too much trouble. We were made to feel very welcome. Nothing bad to say about it....wood burner would have topped it off but we believe that is Happening Wifi is extra but cost us only £15 for 5 days. Bird watching from the deck a bonus. And the loch side lodge and swim is a must. Never been asked to clean any cottage on leaving before with such clear directions but it only took an hour or so, happy to do it. Definitely recommend it and would love to go again once Blair lodge has been upgraded. I had yet another fantastic stay at Invergloy Riverside Lodges. The weather was fantastic, even managed to climb Ben Nevis! Home from home - lovely! We had a wonderful stay at Blair Lodge with our dog Zach. The owners could not be more friendly and helpful. The setting is simply superb, with some wonderful plants and walks within the grounds and a private beach on the loch. We wished we could have stayed longer and will definitely be returning.